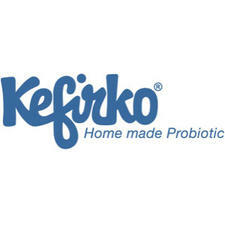 Kefirko is the brainchild of Slovenians Marko Borko (Founder/Industrial designer), Andrej Glažar (Co-Founder/Graphic designer) and Niko Klanšek (Business advisor), who one day tried Kefir (pronounced Kuh-FEAR), liked the taste and health benefits, and tried to make it at home. Finding it a messy and complicated procedure, they turned their talents to finding a DIY way to make Kefir at home that would be easy, keep the kitchen tidy and look attractive at the same time. Wanting the solution to be functional and sustainable they conducted considerable research into the best materials to use, and finally ended up with the Kefirko prototype. With the aim of promoting a healthier lifestyle through DIY food production and supporting kefir-makers worldwide, they built a strong customer support network and launched a Kickstarter (crowdfunding) campaign in 2014 to get production underway. This was met with huge success, which has continued and has allowed further accessories to be developed to make the production of other homemade foods such as cheese and buttermilk possible. Home-made Kefir contains a much higher percentage of kefir-specific active substances that are so important for good health. 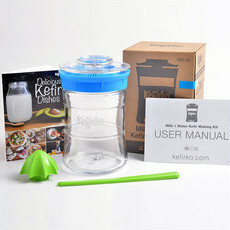 The Kefirko is made with materials that do not react with the contents to enable the kefir to preserve its unique taste and freshness.